This 384 multichannel pipette will solve one of the most challenging barriers to increasing throughput in the lab, which is cost. While automated pipetting will exponentially increase your output, this piece of lab equipment will decrease your funds to the same extent. 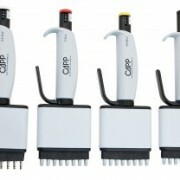 If you are looking to increase your labs output without breaking the bank, then take a look at the CappAero 384. Designed with the same great quality expected from Capp, this multichannel will perfectly suit all of your 384 well plating needs. With the ability to fill a 384 well plate in just 6 aspiration cycles, the CappAero 384 multichannel is a great alternative to an automated pipetting system. The interchangeable knobs help increase throughput by allowing quick and easy volume changes. A comfortable handle and ergonomic design allows for continuous pipetting without risk of strain. To ensure precision and accuracy, the CapAero 384 comes with Capp’s benchmark duel O-ring system. While increasing productivity is an important aspect of any pipette, durability also plays a large role in its superiority. Removing any chances of being a one hit wonder, the Capp Aero 384 multichannel is built to be the power house of your lab for years to come. With a special design and metallic construction of the piston assembly, this pipette is built to last. The unique tip ejection lever considerably reduces your thumb workload as you eject 64 tips with practiced ease. As a company that stands behind its products, Capp offers a 3-year warranty on the CappAero 384 multichannel guaranteeing its longevity. Commonly used in pharmaceutical, medical, military and government laboratories, the Capp Aero 384 Pipettes are versatile enough to fit the needs of many industries. The low price of the pipette is perfect for academic and start up labs determined to increase their throughput without breaking the bank. Research and development labs that already own an automated pipette will also enjoy the speed of these pipettes for any time the system is down for maintenance. 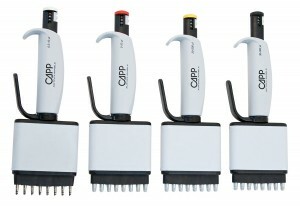 The CappAero 384 multichannel is perfectly designed for PCR, qPCR, micro array, and MALDI spectrometry techniques. If you are looking to increase your labs productivity exponentially without costing a small fortune, look no further than the CappAero 384 multichannel. Available in 16-, 48-, and 64-channels, these pipettes are designed to make 384-well plate work easier and faster. 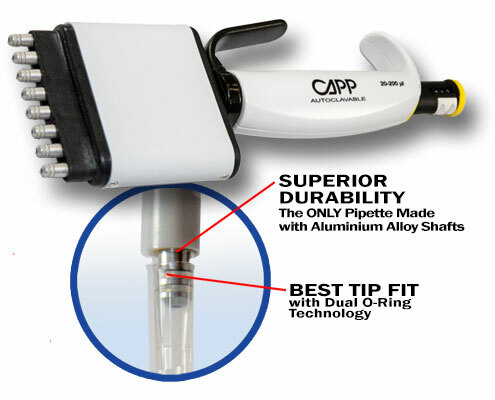 If you have any further questions about this power house of a pipette, please to call or email us directly, or check out the CappAero 384’s product page. A Comparison of Basic Multichannel Pipettes Can a Rainin Multichannel Reduce RSI?